Most of these types of shoe are only made in women’s sizes, so it is pleasing to know where to purchase these in men’s sizes. I hae wide feet, so they are a little tight, but wearable. 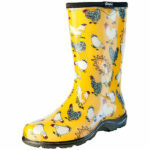 I do a lot of work on our landscaped acre, so the sloggers are very welcome to wear on wet lawns etc. They are great but would suit me better with non-cloth insoles, I find they collect grass seeds and hay etc. Personally I would also like a little more arch support. I ordered these shoes for my husband for Christmas and they arrived straight away, albeit not in the size I ordered. No problems when he called your team. They gave advice on the correct size (a women’s size equivalent to being between the too large and too small men’s size) and sent them off straight away, with a complementary pair of gloves and return postage for the original shoes. He wears them constantly for those light outdoor tasks which don’t merit putting on boots. We will be using your site in the future for our gardening products, with such outstanding service. These sloggers are great. I had my first pair for many years but these ones seem to be even more comfortable than the first. My two pairs of Sloggers are always stationed by the front and back doors of my home but they keep disappearing on someone else’s bigger feet so I decided to get my husband his own pair for Christmas. I am the happy owner of two pairs so thought it fair to buy my poor, deprived husband a pair for Christmas. He’ll no longer have to struggle into his Blundstones just to feed the chooks. bought these for my husband in the wrong size which I exchanged for a smaller size which hubby now wears all the time in the garden.